The rowan trees (mountain ash) remain heavily loaded with berries. Often by this time of year, many trees are depleted and birds have spread their seeds widely. A few rowan berries are being eaten by robins, but the many irruptive birds (sometime visiting northern species) that often feed on them have been remarkably sparse this year. They have been seen, but not with the plentitude of some other years. Finally, I saw a small flock of Bohemian Waxwings. This beautiful bird is named for the red, waxy tips on some wing feathers (seen here). In previous irruptive years, it has frequently been seen gorging on rowan berries and wax berries. So, I have been watching those berries, but without a sighting. 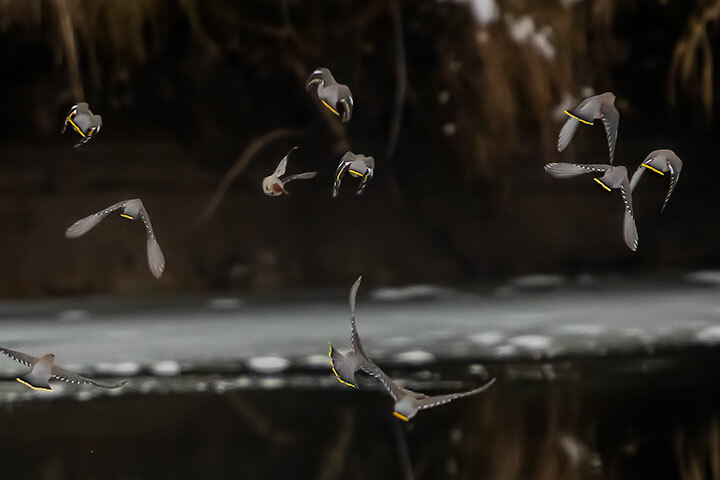 So, what was this small flock of waxwings doing? The flock seemed to be hunting insects! This was really odd. While there probably were a few insects around, they are hardly plentiful, it being January. 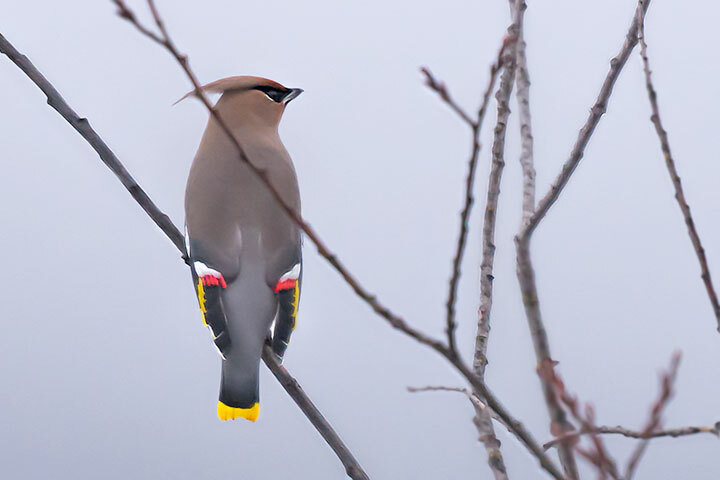 Further, waxwings typically only consume insects during the breeding season. I am confused by this behaviour; Have these birds not read their own wikipedia page? The notion of the Bohemian just acquired an supercharged intensity. I do not experience it as only aesthetic; there is at least performance as well. My other name for the waxwings is “Sculptor bird”…for to me they’re so sleekly feathered, they look like a painted wooden carving! What a beautiful bird! Great photo. Removing waxwings for banding was so special. To be holding these beautiful birds caused unexpected exaltation. Our neighbor has about ten mature rowan trees. The robins have devoured their berries for the last two months. Usually February is when the berries become more palatable and digestible – probably because the freezing/thawing cycles have occurred more frequently in past winters. Few waxwings have been observed this winter south of that imaginary boundary between us. I have heard frogs croaking almost daily and the ants are marching around in my kitchen in January tells me that this mild winter is throwing things way off kilter – like a government shutdown. In past winters the waxwings of both varieties have carried off so many berries as they fly over the road to our place that they leave a wide and colorful trail of orange skins on the ground. Both of your photos give me great pleasure!